Over Labor Day weekend last month, Lady Pebbles and I made a fast trip to northern California to pick up a shop tool that my Dad has been storing for me. While we were rummaging through his shop looking for something, he yelled "Ah! ", pulled out a box, probably two feet square and 18 inches deep, handed it to me and told me to take it to the house for later. I did, went back to working on the project at hand and forgot about it. After dinner, he set it in the middle of the floor, opened it up and started pulling out cameras. He needed to clear them out of his storage area and was giving me first dibs on them. There were a lot of cool old mechanical picture taking marvels. Each was interesting in its own way but there were too many for me to want to bring them all home. 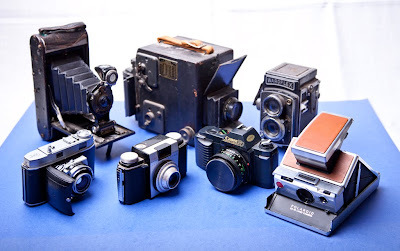 A good portion of them had been given to him over the years by people who knew he had an interest in cameras. He used to have a shelf running around his office to display them on and so it was pretty common knowledge. But since moving a number of years ago, they've been in storage, out of sight. We spent several hours going through them. It was a really cool. We did a lot of web searching on each one, just out of curiosity. When it was all said and done, I choose eight to bring home. One (not pictured) I knew my good friend Rich would appreciate. Three of them have personal history for me. The rest I got just because of their coolness factor.